This guest post comes all the way from Maine. Her name is Melissa and you can get to know her a little better by visiting her blog. I hope you enjoy this post as much as I did. I love gardening, but I don’t have a lot of space. I love visiting my mum on Mother’s Day and spending the afternoon tending the flower beds, but my parents live too far away for me to really enjoy or utilize their garden. We do have a fair sized lawn, but it is shared with our building’s other tenants (as well as their cats, neighborhood dogs, and a large family of groundhogs). This does not a good garden make. What we do have though, is a decent sized deck, and if you use what you have well, you can grow a lot in a little space! (I was always really good at Tetris). If you want to give small space gardening a try, all of these projects are super easy so you can do them yourself! If you live within close proximity to a Lowes, Home Depot, Home Goods, Christmas Tree Shop or other such business, you can snag a shipping palette for free! Most of these places will give you one or set one aside for you if you ask, (if they say no, you can just sneak back around after they’ve taken out the trash for the evening and there’s usually a stack of these bad boys free for the picking). If you don’t live near any of these stores, ask your local grocery or hardware store. You can find palettes almost anywhere! You will also need some sandpaper, (just to get rid of any rough or chipping edges. Nobody likes splinters! ), a tarp, some thick gardening canvas or a shower curtain liner, a staple gun or a hammer and some small nails, some soil, and of course, plants of your choosing. Basically, what you want to do is stretch your canvas, tarp or shower liner over the back and bottom of your palette to hold the soil in and prevent any water damage to the surface you will be leaning your garden up against. Keep your fabric in place by stapling or nailing it around the edges of your palette. A staple gun makes this project much quicker and easier if you are able to find one. Be sure you staple the fabric down along the support beams and not just the frame, or it will be floppy and your soil will be loose. With your prepared pallet lying flat, start filling it with your chosen soil. These are best for plants that have already sprouted or bloomed. 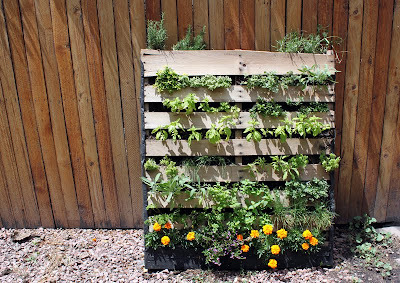 Plant your herbs or flowers between each slat, kind of pressing down in the direction of what will be the bottom of the palette, so that the plants’ roots are behind the beams. This will help keep them secure. When you are finished, lean your palette up against your wall or fence, and voila! 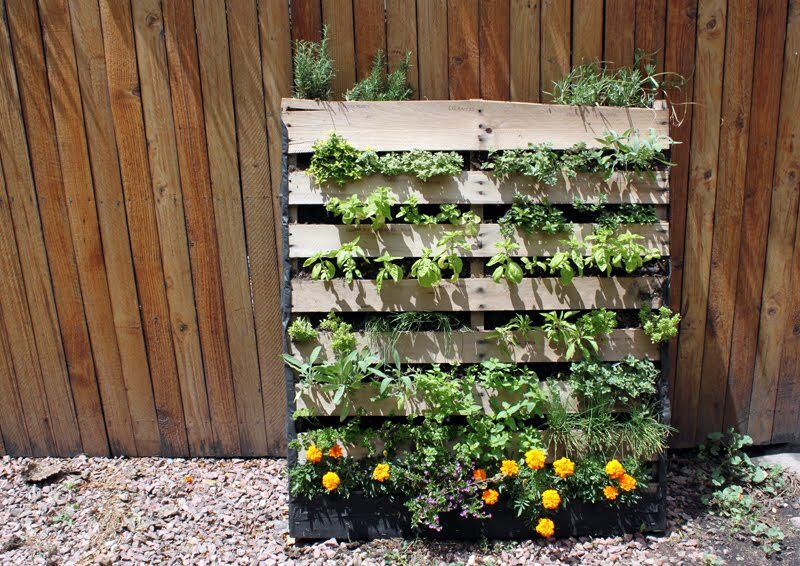 Not only have you recycled a palette that would have otherwise ended up in a landfill somewhere, you now have a lovely, compact, and easy to tend to garden. For this project you will need a hanging shoe organizer (you can find these made from plastic, netting, or canvas at most Target or Wal-Mart type shops), an awl or other pokey instrument, scrap wood or bed risers, a hammer, some nails, a screw driver, strong screws, sturdy wall hooks, soil and plants or seeds. This garden can be super easy, especially if you happen to have a fence or high beam on your deck. If that is the case, you can most likely use the over-the-door hangers that come with the shoe organizer to get it set up. If you need to screw this into a wall or beam, you will need some sturdy metal hooks. Make sure you use screws to secure your hangers, and not nails. Soil, especially when wet, can get really heavy, and unless you are using some serious nails, your garden may rip right out of the wall! Using your awl, poke several holes in the bottom of each shoe pouch so that water can escape. Nail some scrap wood or bed risers on the bottom corners (and maybe one in the middle of the bottom) to keep your garden from rubbing up against the wall. 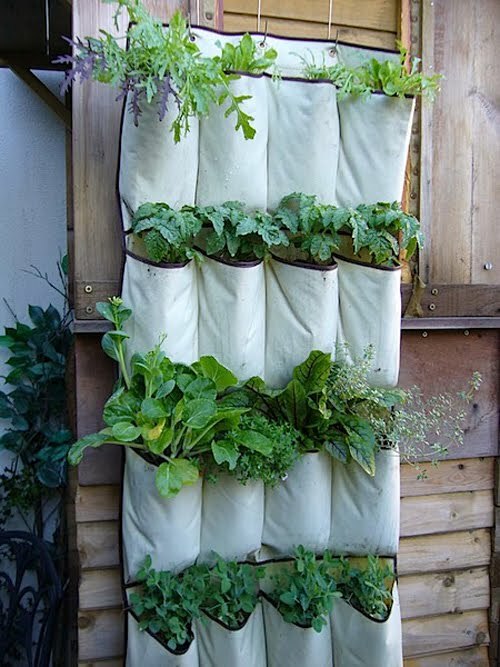 After that, it’s as simple as filling each pouch with soil and your selected plants or seeds! Easy peasy lemon squeezey! This project is a little more involved, takes a little more elbow grease, and is for people with more space. If your deck or porch is big and strong enough, I suppose you could easily build one there, but this is best suited for those with at least a little bit of lawn. To build a spiral garden you will need large stones, bricks, or whatever building supply you prefer, small rocks, sand, soil, and plants. You can make this is as big or as small around and as tall or as short as you would like. All you have to do is simply stack your stones in a spiral, adding more as you get further into the center. Now, you would be wasting a lot of potting soil if you filled it with just that, so line the bottom with some small stones or river rocks, again, adding more as you get closer to the center. You can use sand to supplement the space between the river rocks and your potting soil. Try to pack it well so it supports the larger stones you have stacked. 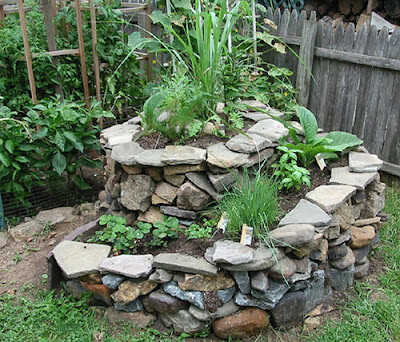 Add your potting soil last and give your stacked stones a good pressing around the outside to make sure they are secure. If you have the patience, you could use cement to set all of your bricks and stones as you stack them to make sure it is extra-sturdy. Now that your structure and soil are in place, you are ready to plant the goods! These are really popular for growing herbs and they look absolutely gorgeous with a variety of colorful blooms planted throughout. This is also a really great project for getting creative. You could make your spiral into anything! Melissa Rae is a travel writer from Portland, Maine. She loves her state and thinks you should come visit! She recommends a hotel in Portland from Excellent Hotels. When Melissa is not on the road, she enjoys tending to her tiny porch garden and using the results to cook tasty meals for her friends and family. These garden ideas are great alternative to those expensive gardens. It saves spaces and its cheaper.